This week my grandmother turns eighty-nine. Consequently I am staying with my parents so I can attend the celebration. I enjoy my jaunts home, whether or not my parents also enjoy my visits changes from moment to moment. My generation does not believe in landlines. One of the perks of coming home is getting to answer my parents’ home phone. 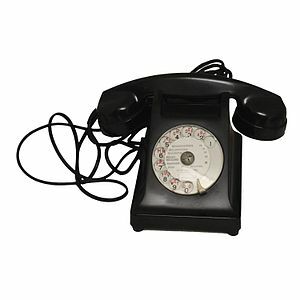 My father uses this line to call his clients and telemarketers use this phone as a way of irritating my father. When I come home I use the home phone to annoy the bejaysus out of telemarketers. And I’ll doggedly answer a second time “This is him” acquiescing slightly to their demand to speak with a man by lowering my voice, but only a little. “Is there a problem?” I’ll ask. “Well Mr. Belnar”, they’ll answer, “It isn’t so much a problem as an opportunity”. This is my favourite part of the conversation, increasingly call centres are being outsourced to countries where English is a second language. These companies can teach their employees all of the grammar in the world, but there’s nothing like an outdated Southern saying to throw a non native speaker off. You don’t realize that confusion makes a sound until you hear it. I’ll continue with my absurd pitch, railroading both the telemarketers’ original purpose and their puzzlement. “Now how many times have you left an umbrella somewhere and lost it?” I’ll say once again without pausing. “Really the item in question is disposable, so my question to you is –Why not treat it as such?” It’s at this point in the non conversation, because the formerly tenacious salesperson has been forced to give up their end of the call from the absurdity of my behaviour, that they hang up. I consider it a personal badge of honor that I have only had to end a call on a telemarketer a handful of times. *For obvious reasons this is not my father’s real name. Although I create such minor mischief as impersonating my Dad, I’m not in the habit of putting his full name on the internet. Unless of course I was going whole hog and putting his phone number alongside with the message “For a good time call”. This entry was posted in Family, Humour and tagged family, humor, Humour, making mischief, parents, Robocall, Telemarketing by The Great Unwashed. Bookmark the permalink. That’s very British “unsolicited calls”. I may try that one the next time I am home. I LOVE this!! Glad to hear I’m not the only one prone to telemarketer harassment. You came highly recommended by Carrie the Great Blueberry and I’m so happy she did so. Off to read some more silly goodness. Thanks for reading Dianne. I’m happy she did so too.